For the full article, head over to The Nosher! Grease two 8 x 6 baking dishes and line with parchment paper. You can also make one large danish in a 9 x 11 baking dish. Heat the milk until warm to the touch but not too hot, about 100°F. Add the sugar and active dry yeast to the milk, and allow the yeast to proof for 5-10 minutes. The yeast will get foamy and bubbly, if it doesn’t your milk may have been too hot or too cold and it is best to start again. In the bowl of a stand mixer with a paddle attachment, combined the flour, salt, and vanilla powder. Alternatively, you can make the dough by hand, you will just need to mix and knead for longer. Add the milk and yeast mixture to the dough, along with the two eggs. On medium, mix until a very shaggy dough is formed. Next, with the mixer still on medium, add the room temperature butter one cube at a time; allow each piece of butter to incorporate before adding the next. Once all of the butter is incorporated, the dough will appear smoother and stickier. Switch the paddle attachment for the dough hook, and mix on medium speed for 5-6 minutes, or until a soft, smooth, elastic dough is formed. It will start out looking very sticky and wet, but will ball around the dough hook towards the end. If it looks too wet and does not start forming a ball, you can add a few tablespoons of flour to help with the consistency. Gently transfer the dough to a lightly greased bowl (it will be very soft and pour out), and cover it with a damp clean kitchen towel. Allow the dough to rise until roughly doubled in size,1-2 hours, depending on the temperature in your kitchen. Once the dough has risen, punch it down and divide it in half. 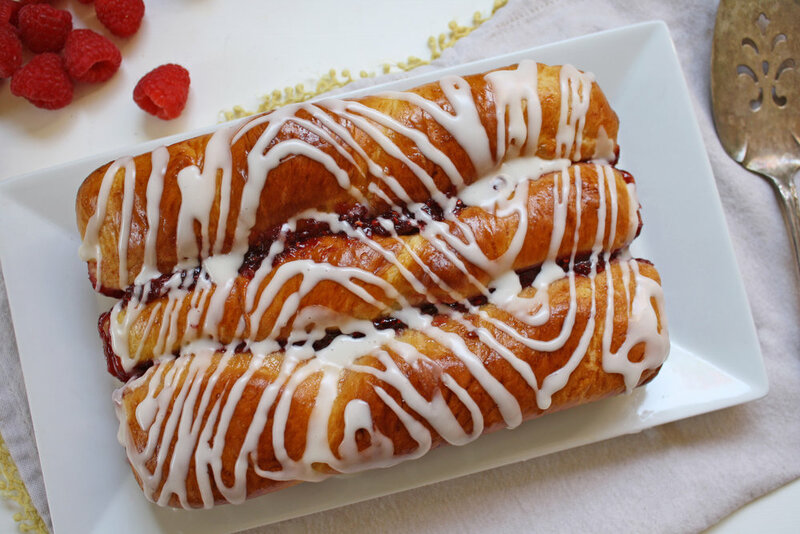 You can make two 8 x 6 raspberry danish twists at this time, or freeze half the dough for future use (just allow it to defrost and come up to room temperature). Dust a clean surface with flour, then take one half of the dough and divide it into three equal balls. Roll each ball into a strand that is about an inch longer than the length of the baking dish, then gently twist each strand and fit them in lengthwise into the baking dish. Cover with a lightly damp clean kitchen towel, and let the dough rise again for another 15-20 minutes. Preheat the oven to 350°F. Add the jam to the danish. Between the 3 strands of dough, you’ll make two strips of jam, each about a ¼ cup of worth of jam, or ½ a cup per danish (if using a larger dish, simply evenly add jam between each strand). I gently nudge the stands apart, and with a spoon, fill with jam between the strands. Brush the top of the dough with the egg wash. Bake for 25-30 minutes or until deep golden brown on top. Rotate once halfway through baking. Once baked, allow to cool on a rack. While the cakes are cooling make the icing. Once mostly cooled, you can ice the cakes by drizzling the icing free form with a spoon, or you can fill a small ziplock back with the icing, and snip off a small piece of the corner to ice in any design you prefer.